I really am a great fan of Skype... I admit it.... The ability to talk to people all round the world, and see them, for no cost has been here for years. When I work abroad it lets me stay in visual touch with my family as well as catching up on all the news. Recently I spent ages talking to Bob Pearlman from the States about new schools and education projects currently underway in the UK. There is massive interest in what we are doing and, by his own admission, the quality of discussion here is so much more advanced than much of that in America. However, we all know that many areas of the States are really beginning to look around and review how they are working in education much more carefully. Whilst we are still learning.. so are they. The trans-Atlantic discussions have the potential to be increasingly interesting. Bob is quite well known in the UK, having presented here several times.He has been a key leader of educational reform efforts nationally in a unique 40-year career and is currently a strategy consultant for 21st Century school development. He served from 2002-2009 as the Director of Strategic Planning for the New Technology Foundation in Napa, CA, a school development organization which supports the replication of the New Technology 21st Century High School model in more than 50 communities across the United States. 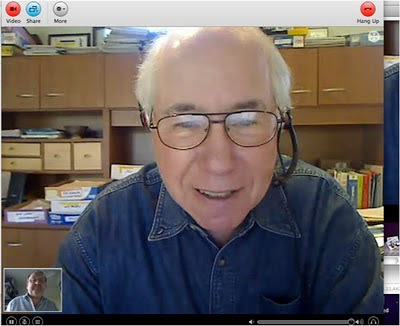 He still consults and speaks widely in the US and the UK on 21st Century Learning. The beauty of Skype is that communication is just so easy. I still don't really understand why more schools don't make more use of it! It offers, potentially, an instant global perspective to any lesson, any subject or any discussion. Relatively not many people use it for learning - why wouldn't they? It makes perfect sense to me - from all sorts of angles.